Whew. It took almost two weeks, but I’m almost done uploading pictures from my visit to New Zealand. 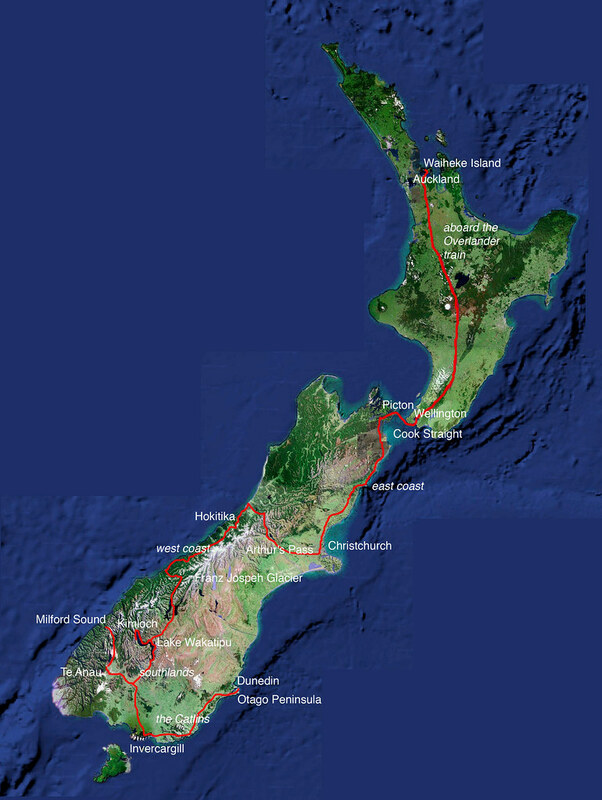 This is the route I took, starting in Dunedin, and ending in Auckland 16 days later. As an extra added bonus, you can click on many of the place names on the map and go to my photos of said place. Isn’t that neat? Link (to larger, but non-clickable version of the map). 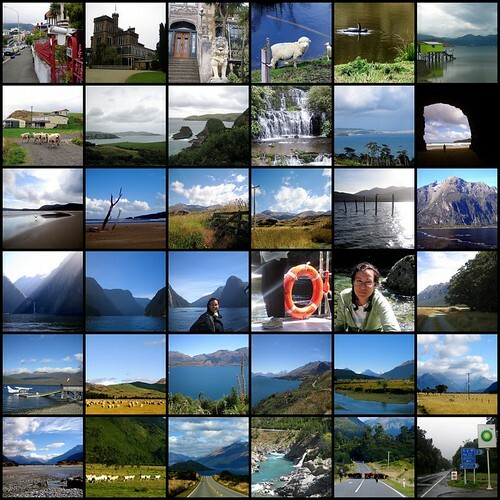 Or, skip this whole clickymap thing and go straight to my New Zealand photoset, or all my New Zealand blog posts. 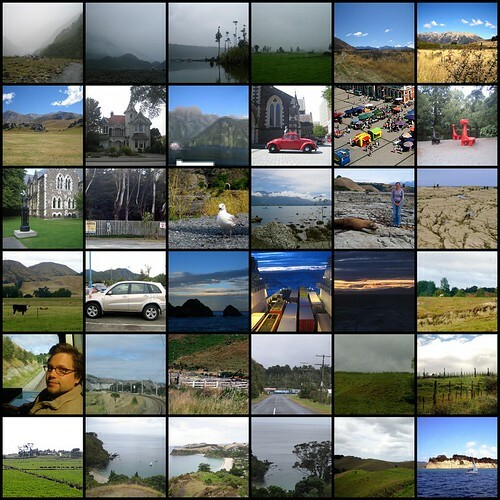 A mosaic of the New Zealand pics I’ve posted on Flickr. It was quite a bit of work whittling down the hundreds I took. And I have several panorama to post as well, should I manage to get some stitching software up and running. Filed in new zealand, photos by me | | Comments Off on pictures, pictures, pictures! Well, I made it back to Vancouver, trading my shorts and sandals for a wool overcoat and umbrella. I would have loved nothing so much as to stay in New Zealand another week/month/year, but I comforted myself with the thought that I will certainly be taking another trip there one day, hopefully not too distant in the future. And for longer next time. There were several places I stayed a few hours or a day I would like to stay for longer, and other places I wanted to see but didn’t. I posted a bunch of pics on Flickr today, though I still have plenty to sort through. After that, I want to post a little write-up of my trip while I still have that post-holiday glow about me. My only real regret about my travel is that I didn’t go to NZ first and then done the summer school. I was highly motivated by the school at the time, but now… let’s just say it’s gonna be hard going back to work. After leaving Christchurch behind, we drove Lurch (Janelle’s rental RAV4) up to Picton and sadly returned her. As much as I’m your typical good, planet-hugging-liberal, anti-SUV type, after ten days of steep, single-lane mountain passes and winding, unsealed backroads, I have come to appreciate the RAV4 an awful lot. And I wasn’t even driving. The next step was the ferry to Wellington, moving to North Island. Here’s a tip for all you ferry travellers crossing the Cook Straight: it’s a bumpy, rocking, sea-sickness inducing ferry ride. Don’t start it off in the fo’c’sle lounge with multiple coke-and-bourbons and pottles of fries. Pottles are what fries come in when one is in NZ. The fo’c’sle is the part of the boat where the bar is. Educational, yes? The Wellington downtown backpackers is in a sketchy area near the ferry and train station, and built in a huge old Art Deco hotel with tiled everything and a grubby film noir atmosphere. Though I was just there to sleep, not become embroiled into a tale of scandal, violence and intrigue. Early, early the next morning, a train took us across North Island from Wellington to Auckland. Now, I don’t want to dis North Island, since I was just crossing by train. But after the jawdropping splendor of South Island, well, the scenery was nice, and pretty, and oh-so-lush, but it didn’t take my breath away like South Island did. It was just a twelve-hour train ride through some lovely, rolling farmland. However, I’m now on Waiheke Island, a 30-minute ferry from Auckland. It’s a little volcanic island full of vineyards and artists workshops and little beaches and holiday homes, and it is quite gorgeous. What it doesn’t have is much internet, so I probably won’t be uploading any pics until I get back to Vancouver. Which, to be honest, as much as I love Van, I could happily spend another month or two here.